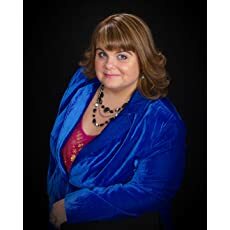 Ann Aguirre is a national bestselling author with a degree in English Literature; before she began writing full time, she was a clown, a clerk, a voice actress, and a savior of stray kittens, not necessarily in that order. She grew up in a yellow house across from a cornfield, but now she lives in sunny Mexico with her husband, children, two cats, and one very lazy dog. She likes all kinds of books, emo music, action movies and Dr. Who. She writes urban fantasy (the Corine Solomon series), romantic science fiction (the Jax series), apocalyptic paranormal romance (the Ellen Connor books with Carrie Lofty), paranormal romantic suspense (as Ava Gray), and post-apocalyptic dystopian young adult fiction. Read excerpts of her novels at Ann Aguirre’s website. Read Stephen’s interview with Ann Aguirre. 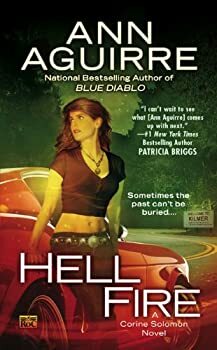 We have with us today Ann Aguirre, national bestselling author of science fiction and fantasy who is also the romance novelist, Ava Gray whose Skin Games hits shelves today. Ann has become one of the more popular fantasy and Sci/Fi writers of recent years. And we are very pleased to have her with us today. She has also graciously agreed to stop by and answer our questions today. So, after reading the interview, be sure to answer questions and let her know which of her books you'd like: Doubleblind, Skin Games, or Blue Diablo. Stephen Frank: I was looking at your website and I see that you’ve been a former clown. Can you tell us a little about that? I'm not usually a sci fi reader. Call me a wuss, but whenever I would try to read sci fi, I usually got too distracted by all the sciencey stuff to remain focused on the story. 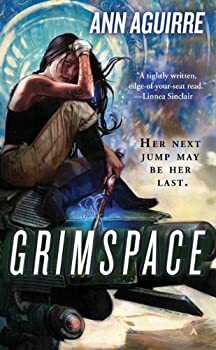 But I had seen Grimspace advertised on a website and the cover caught my eye. At that point my reaction was about as intellectual as "Ooo, pretty colors..." but hey, attractive covers are a plus. Then the book caught my eye again, this time in the bookstore, and lo and behold, it sounded interesting. I figured, what the heck? What I didn't know at the time of purchase was that it's something called "romantic" sci fi. This left me a little worried; I wanted what was promised to me on the back of the book, not a romance novel with spaceships and lightsabers. So one of the problems I've been having recently, when it comes to returning to authors I've already read, is book blurbs that fill me with a sense of foreboding. The plots have been sounding so thin (and often matching). Not Wanderlust though. When I read the blurb for Wanderlust, I got excited. 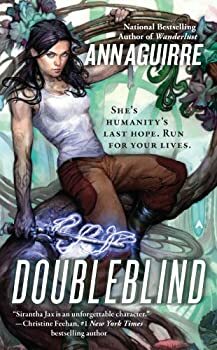 Of all the books I’ve been looking forward to this year, Doubleblind was pretty high up on the list. 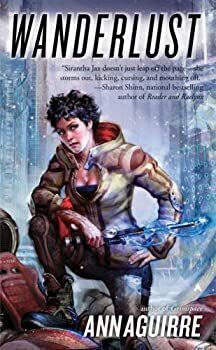 When we last left our heroine, Jax, she was in the orbit of Ithiss-Tor, preparing for a diplomatic mission with high stakes: Recruit the distant but formidable Ithtorians to the human cause. Fail, and the human race gets eaten by the Morgut. If they’re lucky. But the Ithtorians aren’t very fond of the idea and Jax’s job is to change their minds. She also has to deal with March, whose head is pretty much screwed six ways to Sunday thanks to the war on Lachion in Wanderlust. Mari Thistle is just trying to survive and take care of her two younger siblings. Because she lives in the Red Zone and not in the safety of the walled and guarded fortresses where the rich people live, she has to take on some dangerous jobs. Her latest job, which involves sneaking into one of the fortresses and stealing something, has gone bad and she knows she’s likely to be killed by Stavros, the boss who hired her. When she’s rescued by a guy named Thorne Goodman who’s planning to challenge Stavros’ leadership, she finds herself caught in a brutal turf war. Razorland — (2011-2017) Young adult. Publisher: WELCOME TO THE APOCALYPSE. In Deuce’s world, people earn the right to a name only if they survive their first fifteen years. By that point, each unnamed ‘brat’ has trained into one of three groups — Breeders, Builders, or Hunters, identifiable by the number of scars they bear on their arms. Deuce has wanted to be a Huntress for as long as she can remember. As a Huntress, her purpose is clear — to brave the dangerous tunnels outside the enclave and bring back meat to feed the group while evading ferocious monsters known as Freaks. She’s worked toward this goal her whole life, and nothing’s going to stop her, not even a beautiful, brooding Hunter named Fade. When the mysterious boy becomes her partner, Deuce’s troubles are just beginning. Down below, deviation from the rules is punished swiftly and harshly, and Fade doesn’t like following orders. At first she thinks he’s crazy, but as death stalks their sanctuary, and it becomes clear the elders don’t always know best, Deuce wonders if Fade might be telling the truth. Her partner confuses her; she’s never known a boy like him before, as prone to touching her gently as using his knives with feral grace. As Deuce’s perception shifts, so does the balance in the constant battle for survival. The mindless Freaks, once considered a threat only due to their sheer numbers, show signs of cunning and strategy… but the elders refuse to heed any warnings. Despite imminent disaster, the enclave puts their faith in strictures and sacrifice instead. No matter how she tries, Deuce cannot stem the dark tide that carries her far from the only world she’s ever known. 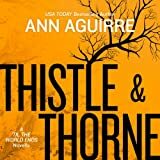 CLICK HERE FOR MORE TITLES BY ANN AGUIRRE.